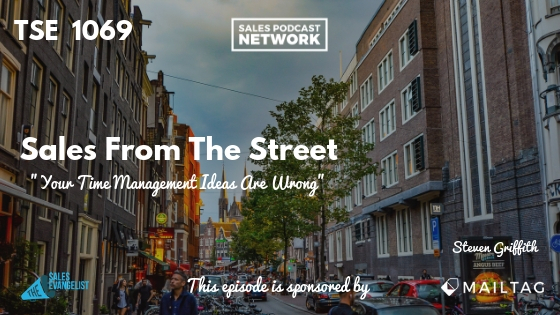 TSE 1069: Sales From The Street - "Your Time Management Ideas Are Wrong"
Many sellers elongate the sales process without even realizing it, and Steven Griffith is here to talk about how to take control of your time and to explain that your time management ideas are wrong. Steven is a performance coach and the author of the book, The Time Cleanse: A Proven System to Eliminate Wasted Time, Realize Your Full Potential, and Reinvest In What Matters Most. He explains how to close the performance gap and get hours back in your day. Steven discovered about five years ago that all of his performance clients were pointing to the same roadblock to their success: they didn’t have enough time. He even discovered that he was feeling the same way. Technology has created more distractions and it prompts us to multi-task all the time. Our lives are moving at an incredible pace and we’re all over-stimulated by toxins that steal and hijack our time. Old time management strategies worked when the phone was connected to the wall by a cord. We live by the notion that time is scarce so we’re working to cram as much into each hour as we can. Most people have an adverse relationship to time, so Steven teaches his clients to establish a positive relationship with time so that time becomes abundant. It’s a matter of viewing time as an ally rather than a foe, and working with it instead of fighting against it. Consider the phrase “if time allows.” Steven routinely asks people whose time they are referring to when they use this phrase. We’ve conditioned ourselves to believe that time has the power to allow us to accomplish things. We buy into the idea that time is an outside thing that we’re working against when, in fact, we are time. Steven talks about compressing a sales cycle to fit one year’s worth of sales into one month. He tells the story of a real estate professional who sells luxury real estate in L.A. He had health issues in the third quarter and he was really underwater. They worked together to do a time cleanse that would help him compress his time. Steven said we all have a built-in belief system about how long a sale takes. We’re conditioned by our industries to believe in ideas like slow seasons and high seasons. Our mental framework keeps us in that mindset, so we get stuck. We might go up or down by 10 percent but we’ll always come back to our conditioned thermostat. Steven asked the agent if it was possible to complete a year’s worth of sales in 10 months’ time. Without worrying about how to do it, he simply wanted to know if it could be done. Could it be done in 8 months? Or 6? 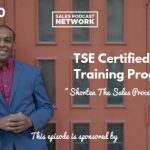 Steven worked to break apart his self-limiting beliefs about how long the sales cycle takes. By the time they got down to 8 weeks, he admitted that he didn’t know how he would do it. They started building a new framework in which it was possible to do a year’s worth of sales production in 8 weeks. They started by identifying the activities that the agent absolutely had to do. Steven calls these ROT activities or high return-on-time activities. His biggest business-generating sales activities were his 10×10, (10 contacts by 10 a.m.) and researching the market for pre-qualified buyers. His time cleanse involved identifying different categories like technology, people, places, and others and categorizing their time. Once they had written everything down, they considered whether each activity was contributing to or contaminating his time. They identified his time there as a contaminant because his visits often turned into two-hour stays. Instead, they sent his assistant to get his coffee each day. By the end of the activity, they reclaimed 25 hours a week, 8 of which was the coffee shop. The time cleanse gives you the opportunity to evaluate whether you’re doing the right things at the right times. He redistributed his time and assigned his non-revenue-generating activities to his assistant as well. Next, Steven showed his client how to set his day up to perform. He calls the concept timefulness, which is an advancement of mindfulness. It’s being present in the moment so that we stop multitasking. We maintain a single focus which can 2 or 3x our results on its own. The client put everything on his calendar, and he created a reset strategy. He set an alarm on his phone to go off every hour, and when it did, he would check to make sure that he was being mindful. If he wasn’t following the plan at that point, the alarm was his cue to return to it. After about two or three weeks, he couldn’t believe how quickly the sales started coming. 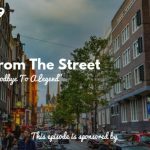 Like many people, he said, “I can’t believe this is happening so fast.” Steven cautions people to avoid that mindset because that doubt will keep things from happening quickly. The client got laser-focused on his activities that generated revenue and he developed a relationship with time that supported those activities. He didn’t feel like he was fighting the clock anymore. Be aware as a seller that if you’re stressed out, people will sense it and they likely won’t want to be around you. At the end of 8 weeks, the client had done the most he had ever done in a quarter, and he went on to hit his all-time career record that year. We must overcome what Steven calls our “always way of being,” which is our belief that certain activities take a certain amount of time. We’ve been conditioned to believe that work must be hard and that we must grind to achieve the things we want. Although it’s true that you must have time in order to conduct sales, it’s possible for sales to happen instantly. Begin by asking yourself how you can compress time. If you don’t ask the question, you’ll never get the answer. Don’t use the phrase time management. We don’t manage our family members, but rather we want to be connected to them and work in unison with them. The same is true of time. If you find yourself wanting to try Steven’s concepts, begin by shattering the neurological connections in your mind that say this isn’t possible. Then, do your own cleanse. Determine what is contaminating your time. Anything that is holding you back from accelerating your goals and dreams is a contaminant. Write down every single interaction and ask yourself whether your activities are contributing. It could be Facebook, negative people, or any other thing that takes up your time. Most people get back a minimum of 10 hours, but most get back 20 or more. If we say things like “Time doesn’t allow,” it lets us off the hook because we aren’t in charge. Instead, go on a time-excuse diet where you stop using time as a justification for not accomplishing things. As an entrepreneur and sales professional, the word no is as powerful as the word yes. Realize what you’re saying yes to, what you’re saying no to, and where your high-performance hours are. Steven dedicates an entire section of the book to setting up their day to perform. In fact, many people are doing the right activities at the wrong time. We must determine when we have our best energy and then cluster those similar activities together. Our brains work more efficiently and we’ll get better results. If you are time, and you’re 100 percent accountable and responsible for it without letting anything steal it, you take 100 percent control of your life and the results you get. If you’d like to connect with Steven, go to stevengriffith.com/salesevangelist for a free download of his top 10 performance tips to help you perform better with time. You can also pre-order a copy of his book, The Time Cleanse: A Proven System to Eliminate Wasted Time, Realize Your Full Potential, and Reinvest In What Matters Most. When you do, you’ll get free access to his master class that walks you step-by-step through the cleanse process.